The season is upon us. Our diaries are full of them, Facebook is full of them, love really is in the air. But what happens when you have 6 weddings in one year and a limited budget for buying shiny new things? You don't want to end up spending everything on evening wear you can only wear a couple of times before everyone's 'seen it already'. Seasonal clothing budgets are far better suited to expensive handbags and overpriced Chanel espadrilles. So, in the words of Mrs Doubtfire, HELP IS ON THE WAY DEAR. 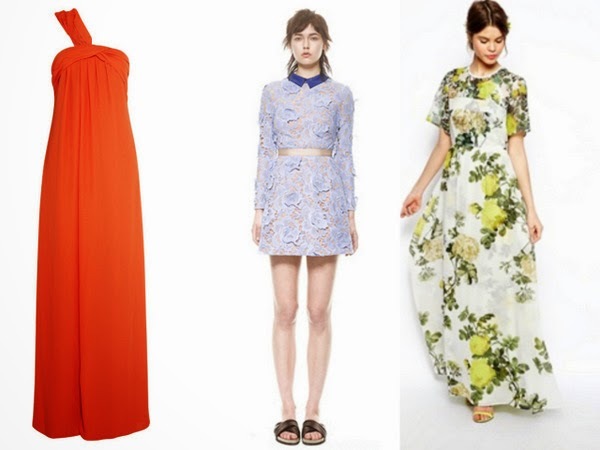 First up, these high street buys have an expensive looking bang for very little buck! Colour is a great way to make maximum impact, my personal favourite evening dress is just from H&M but in a neon yellow colour it really stands out. 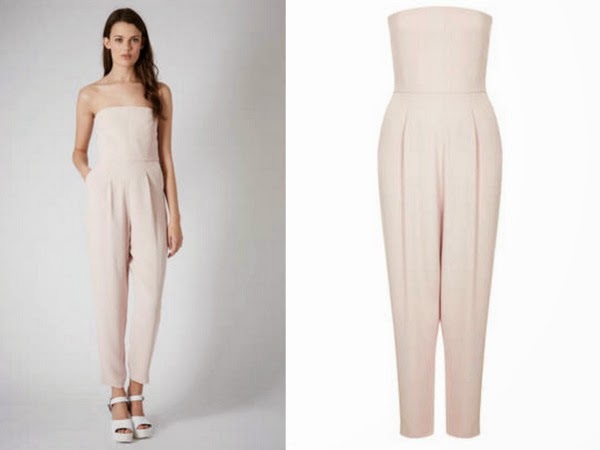 The alternative to the evening dress comes in the form of a tailored bandeau jumpsuit this season - the best being Topshop's version (£60) which comes in both blush and black. Halston Heritage is especially good for full length gowns at around the £200-£300 price mark. I've mentioned new brand Self Portrait on here before but they deserve another mention for great affordable evening wear. DKNY's collections keep getting better and better, and this invisible strap plunging back dress speaks for itself. Yes the price is a little steeper, but this dress will last the distance, and in black you can get away with wearing it more frequently without people noticing! Richard Nicoll, Helmut Lang (and Theysken's Theory) are always brands I look to for fun, offbeat evening dresses that don't feel too grown up. 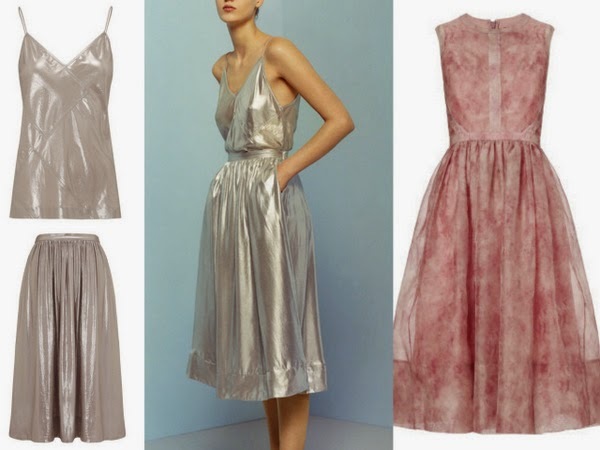 Whistles has pulled out all the stops this season and this silver top and skirt combo feels more current than a dress, but still has evening appeal. Plus you have the added bonus of being able to wear the two separately in a more casual way - skirt with a white tee and converse for work, slip top with a pair of boyfriend jeans and Birkenstocks. 1. The Outnet - Net-a-Porter's little sister The Outnet is a discounted designer dreamland filled with well edited selections of top brands for majorly reduced prices. Find a Philip Lim mini for 65% off - or even an Oscar De La Renta gown for 70% less than it's retail price. 2. Bicester Village - Similar to The Outnet, Bicester is the perfect place to find an amazing designer evening dress at up to 90% off. Evening wear doesn't really follow the trends too closely so who cares if it's last season's Valentino if it's totally beautiful? 3. H&M - Check out their bi-annual collections of premium pieces which tend to sell out in a matter of hours so you need to be on the ball! 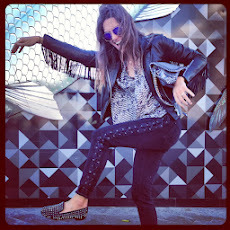 (check out a post I did on this summer's collection here). They always have a couple of amazing evening dresses and usually for under the £100 mark. Their 'Conscious Collection' usually throws another couple of great dresses in the mix too - so sleep with one eye glued to the site. 4. ACNE - I've mentioned their evening wear before but it really is simple, minimal, fuss free and - well - just cool. 5. 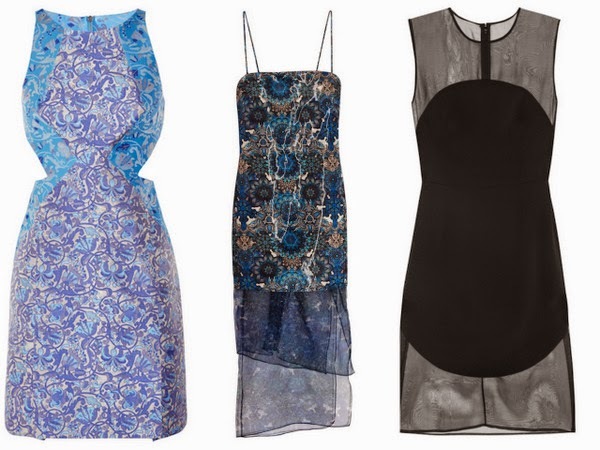 The Sales - Summer sales really are the best place to find an amazing eveningwear bargain. Harvey Nichols is my personal favourite as they have such a good buy, and the mark downs are great too. A little heads-up, Matches sale starts on Monday (16th) so I would guess that Harvey Nicks, Harrods, Selfridges and Net-a-Porter won't be far behind.